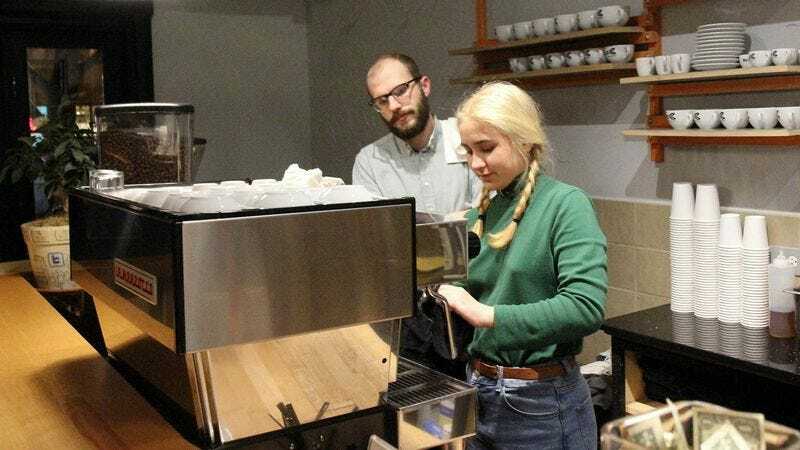 KIRKLAND, WA—Shaking their heads as they watched the man struggle to make correct change and overheard him botch back-to-back orders, every customer at local coffee shop The Daily Bean confided to reporters Friday they could tell the store’s newest trainee was a definite goner. “Yikes, this guy’s steamed milk technique is all over the place—that’s not going to fly,” said local accountant Elizabeth Delaney, looking on in a mixture of pity and annoyance as the doomed new hire spent a full minute aimlessly searching the back bar for the cafe’s almond flavoring syrup. “I’ve been here almost a half hour, and this guy still can’t even figure out how to get the credit card machine to work. Oh, geez, now he’s calling that woman back to the counter to make sure she said skim milk and not soy milk. I give this guy until the end of the day, tops.” At press time, everyone in line winced as a veteran employee made the trainee step aside while he just operated the espresso machine himself.